Framing public policy decisions: What systems do we consider? I recently helped Warner North with a project for the International Risk Governance Council (IRGC) in Geneva. Warner is long time colleague and a National Associate of the National Research Council. The IRGC topic was how to manage emerging risks. Things like the Gulf Oil spill, PG&E’s gas pipeline explosions, financial collapse, etc. The paper we wrote is on the IRGC website. After the project was over we were asked to do a seminar on framing emerging risks for graduate students in the Management Science and Engineering Department at Stanford University. It gave us an opportunity to reflect on what we had learned in the IRGC project. A key framing question is, “What systems do we have to consider? 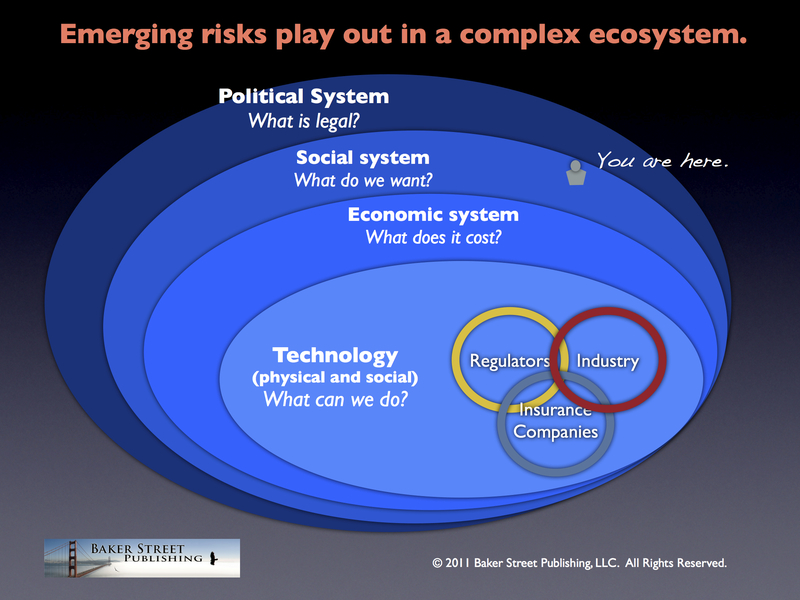 ” For the Stanford seminar I constructed a Venn diagram of the ecosystem in which risk management decisions get made. Industry does not act alone. They are part of an overlapping system of regulators, insurers, and industry. To understand industry’s decisions we have to understand the decision making in all three systems and how they interact. At the next level is the economic system: What does it cost? The traditional “cost/benefit” analysis stops at this level in the ecosystem. More enlightened economists are starting to work at the next level in the ecosystem: The Social System. At the social system level the question is: What do we want? This of course depends on our values. And finally there is the political system — the top of the decision food chain. Here the question is, What is legal? Political decisions are so difficult because they deal with all the systems. It is important to have some sense of which systems we have to consider when we are framing decisions. This diagram offers a part of the framing for any public policy decision — health care, renewable energy, fishery management. You name it. For more about public policy decisions see, Public Policy Decisions in California: Big challenges and how they can be met.